Seminar Based Black Belt Degree Programs!! Seminar based Training Enters 32nd Year! 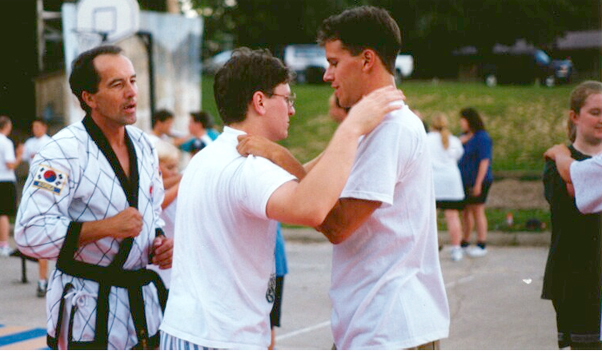 The Midwest Hapkido Federation has offered training for over 32 years. We have two programs. A complete classroom ciriculum can take you from beginner to black belt at our certified center in Columbus. A seminar based program allows experienced martial arts black belts to learn and earn black belt tactics and credentials in Hapkido. The training consists of quarterly seminars at your school or ours. Fees are reasonable and the training compliments Taekwondo and Karate stylists. Over 300 black belts from other disciplines have earned degrees in Hapkido from us since 1976! EARN HIGHER RANK! We train and certify Instructors, Schools and Individual Black Belts! 2014-15 Clinic Schedule is now forming. Let us train you in the style that combines hard style strikes and kicks with joint locks, submission holds and restraint tactics. Advanced black belts learn a weapon discipline for each belt level along with advance grappling and submission tactics. Contact HQ to schedule a seminar at your academy or bring a group to Columbus. Copyright © 2005 Midwest Hapkido Federation. All Rights Reserved.